I'm looking way ahead this week. All the way to 2017! I'm really excited about this novel and the new year is going to be much more exciting, thanks to this January release. This novel has intrigue written all over it! 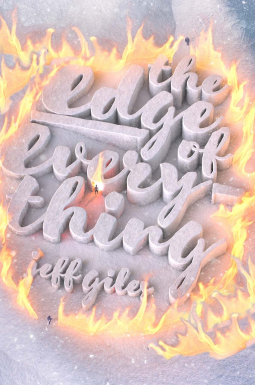 When their worlds collide, a Montana girl named Zoe and a bounty hunter called X grapple with the ultimate sacrifice in order to be together in this cinematic, star-crossed romance series debut by Entertainment Weekly veteran Jeff Giles. The past year has not been easy for seventeen-year-old Zoe. Far from it, in fact. Still reeling from her father's shockingly sudden death and her neighbors' mysterious disappearance, she questions if there's anyone, or anything, she can still count on. Zoe's mother is holding down multiple jobs just to get by, her little brother's ADHD is off the charts, and on a terrifying sub-zero, blizzardy night in Montana, she and her brother are brutally attacked in a cabin in the woods. But then Zoe meets X. Mysterious, handsome, and tormented by a fate he doesn't understand, X is a bounty hunter of evil souls from a special kind of hell called the Lowlands. X and Zoe were never meant to meet, but their paths cross when X comes to claim his next victim. Hopelessness, punishment, and pain are all he's ever known…until Zoe shows him what his heart is really for. But escaping his duty and the ties that bind him might mean the ultimate sacrifice for both of them. And look at that cover! I hope it doesn't change from now until release, because it's pretty hot! I've been seeing this around and it looks good. Hope you enjoy it! Ohhh I haven't heard of this one yet! It sounds interesting and I love that cover! Great pick! Thanks! Glad you've found it! Glad it caught your eyes! Thanks for stopping by Dani! WOW Awesome pick I saw a lot of readers post this book in there BEA haul and it most definitely looks and sounds absolutely fantastic! I hope you enjoy it when you get the chance. Thank you for stopping by my WOW for this week.